The system makes light work of day to day transaction posting. Entering a transaction is a one step process with the system automatically updating all ledgers as appropriate. 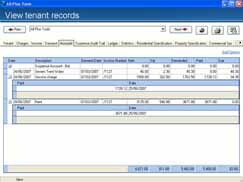 For example, enter a tenant income transaction and the system will automatically update the tenant account, client statement, cashbook reconciliation, debtors list, service charge accounts, tax and VAT databases. If required the system can also automatically print a VAT receipt. 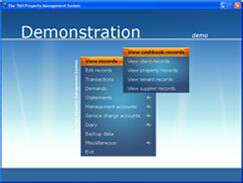 Once transactions have been entered you can easily manipulate and design the data using the new interface grids. For example you could draw up a report detailing all service charge expenditure for a particular time period, grouped by supplier with subtotals, counts and averages. This report can then either be printed or exported directly to Microsoft Excel. The suppliers ledger allows you to operate a day book, recording all invoices as they come into the office. This is an excellent way of organising payments to suppliers and is especially useful for larger offices who receive numerous invoices each day. The cheque writing facility will automatically fill in pre-printed cheques, taking the labour out of manually entering the payee and amount details. The BACS exporting facility allows you to export details of BACS payments to suppliers. This information can then be imported directly into your bank software package thereby streamlining your daily procedures. The system automatically updates all the appropriate ledgers. The system will automatically update all the appropriate ledgers. Designing and exporting your own expenditure report. Use the day book to keep track of all invoices coming into the office. BACS exporting will streamline your daily procedures.